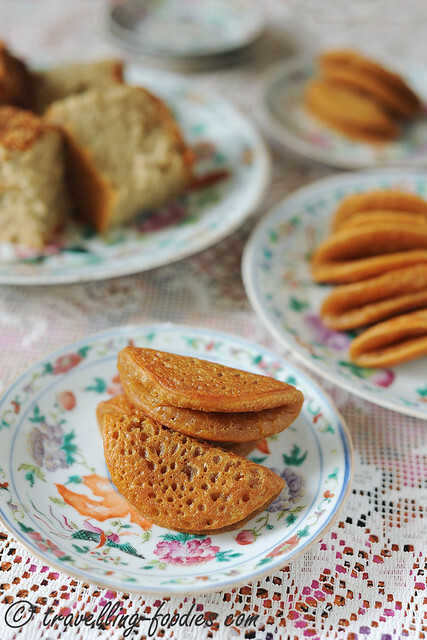 Apom balek is a traditional Peranakan snack, or what is traditionally called “kueh chuchi mulot embok embok“. It is an important kueh in a traditional Straits Chinese wedding, served alongside kueh dadar, pulot serikaya, ondeh ondeh, pisang goreng and many others suited for the joyous occasion. I was also told that apom balek may be served as a snack for folks who attend funeral wakes as well, alongside kueh genggang biru, putu tegair and other kuehs. So basically, its versatility justifies its importance in the Peranakan culinary culture. 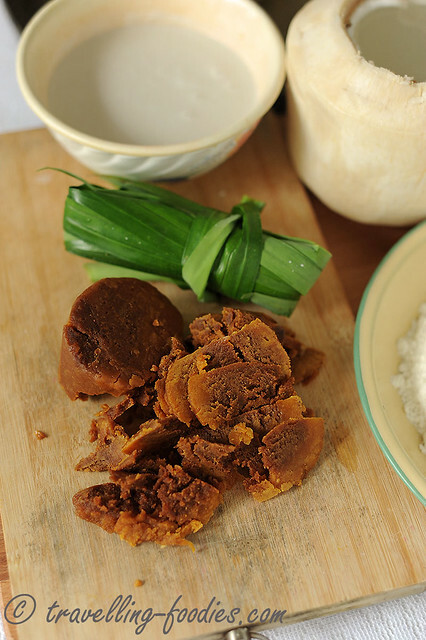 The ingredients are very simple for apom balek, but all play pivot roles in ensuring a good kueh. First of all is the quality of the gula melaka used. Apom balek is in essence, a celebration of the use of gula melaka in traditional kueh chuchi mulot as well as its marriage with santan, a common combination we see in so many other kuehs as well as the all-time favorite, pengat. To me, good gula melaka should （1）be soft to cut and even to pinch off, (2) exude a beautiful and mellow aroma, (3) taste pleasantly sweet with a sense of richness and depth, (4）have a uniform coloration when sliced through without the core looking paler. 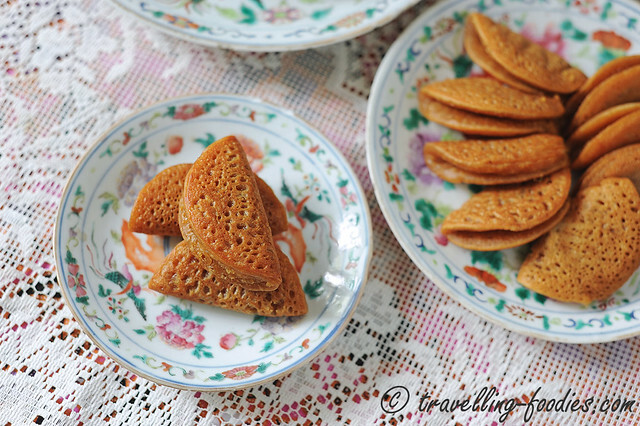 In short, good gula melaka should excite and invigorate your senses. An old trick which I’d picked up recently from an encik at a friend’s relative’s funeral was to let the apom balek batter sit for an hour or two before using. It didn’t occur for me to do that but now in retrospect it all made perfect sense! 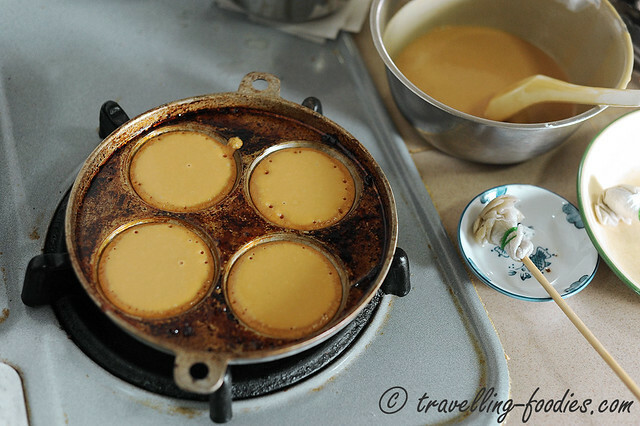 Sitting the batter allows time for the flour components to thoroughly absorb the moisture from the wet ingredients, in this case, the coconut milk and gula melaka syrup. This is the same trick that is used in French pastry making as well, especially for petit four secs like madeleines, caneles or frangipane. This ensures a more homogenised batter for soft and fluffy apom balek. I made a blooper during the preparation of the batter as I did not allow the gula melaka syrup which was dissolved in coconut water to cool down sufficiently to room temperature before combining it with the mixture of dry ingredients. The residual heat may have activated the baking powder prematurely. The apom balek did not rise as much as I’d hoped them to be and the kuehs could have been more fluffy indeed. Nonetheless, the experience gave me a chance to practice flame control which is very important in the making of apom balek. It proves to be more finicky than apom berkuah which posted lesser challenges seemingly. Or maybe I was just lucky. 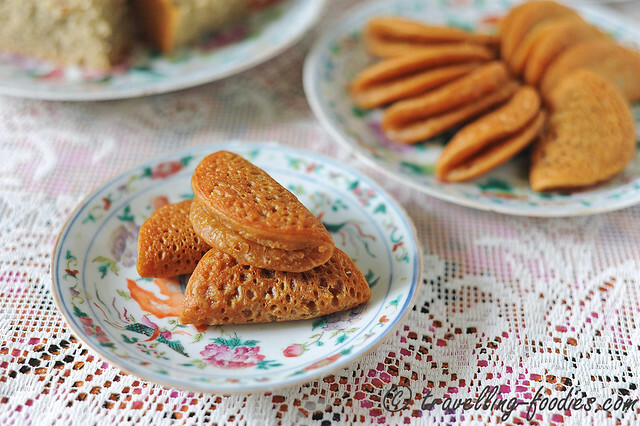 The surface of the apom baleks were also more pockmarked than usual, signalling higher working temperature than what is required perhaps, or there was too much residual oil in the mould cavities before pouring the batter in. These are things which I’d have to work on in future attempts. On a more positive note, I did managed to get some beautifully coloured apom balek, much better compared to my first attempt. Not entirely happy with this batch of apom balek made. The quest for perfection goes on! This entry was posted on December 31, 2014 by Alan (travellingfoodies). It was filed under Food, Simple Eats and was tagged with air kelapa, apam balik, Apom balek, apom balik, ayer kelapa, ayer klapa, Baba, daon pandan, daun pandan, gula melaka, Nonya, Nyonya, Peranakan, santan, straits chinese. I love this. Made a few times but the bottom always burnt easily before top is cooked. i put lowest fire n covered the kuih when holes appeared. Why ah? Hope to get recipe from u. Thanks. You will need a cover for the mould. The cover has to be heated as well before using it to cover the mould when the bubbles begin to appear on the surface of the apom. This helps to cook the surface.